I just finished a new collaboration with composer Knut Vaage, Multimorf 3, a composition for waterfall and trombone. The image above is a snapshot from each of the nine sections of the piece. 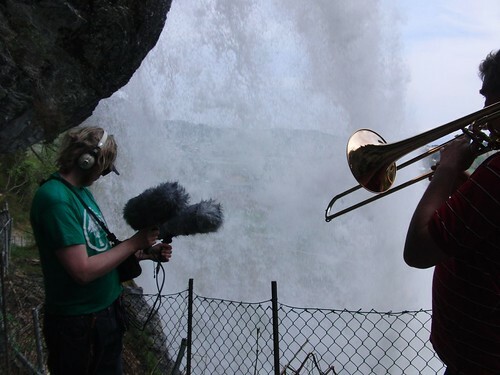 The trombone plays together with recordings of waterfall and layered trombone overtones (also combined with live processing of the trombone). Vaage has together with sound designer Thorolf Thuestad created nine morphed backgrounds of waterfall recordings and trombone overtones. The trombone player, John Arild Suther, chooses how long each morph section should be played and in which order they should be played, as well as which sections of the composed score he wants to play within each section. This opens for very different performances based on the same material. The video is conceived in a similar way to the morph backgrounds. 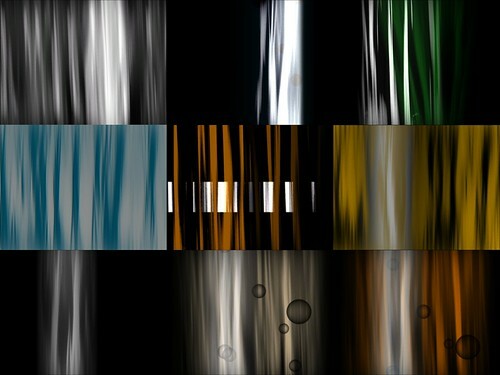 The material is based on waterfall recordings and generated material, and each of the nine sections can be viewed as individial motion paintings. My intention was not to create something that followed the music directly, but to create a visual component that responded to the energy contained in a waterfall and to reflect the individual qualities of the nine sections. Since the length and order of each section can vary for each performance, I wanted each section to focus on layers instead of creating linear trajectories: If you see thirty seconds or four minutes of a section you will get more or less the same visual content, it is the combination and length of the different sections that create the linear dynamic of the piece. The trombone player controls both the playback of video and sound backgrounds, using midi foot pedals, making it relatively easy to tour with the piece without involving too many people. Multimorf 3 premiered on August 12th at Baroniet in Rosendal (probably one of the most beautiful places in Norway). We played outside in the courtyard of the Manor from 1665 to an enthusiastic audience. It will also be performed at Bergen Architechture School on September 1st (together with multimorf 2), and at Integra in Copenhagen October 1st.